Serious home chefs, or just house-proud owners, might consider the kitchen their showstopper room—the one that will stop potential buyers dead in their tracks. And that’s why they add all the upgrades, accoutrements, and trendy new finishes they can possibly find. 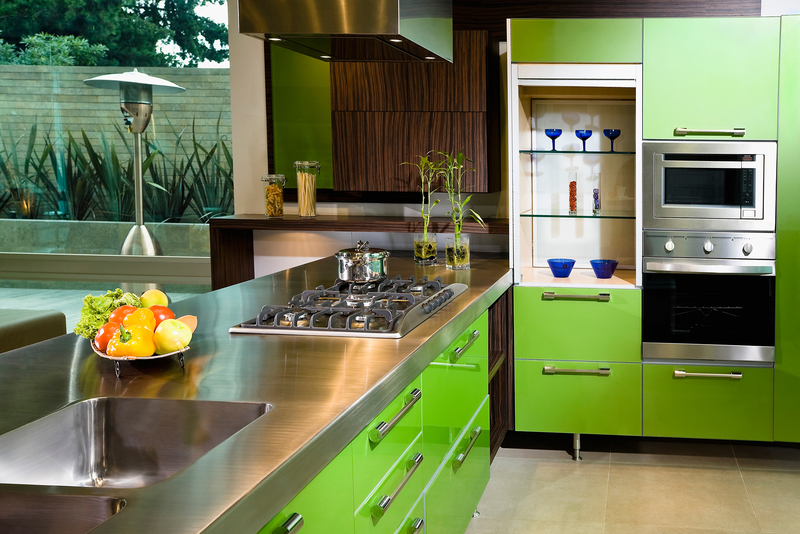 To some extent, they’re absolutely right—a great kitchen can make a buyer fall deeply in love. An inherent danger of taking a deep dive into modern design is accepting the harsh fact that today’s trends may be tomorrow’s “Oh, God, remember that?” fads such as fake brick or hideaway appliances. With the average kitchen remodel pushing $20,000, designing without foresight can be a costly and embarrassing mistake. Some trends such as subway tile and granite countertops have a long tail: Designers expect they’ll be in style for the foreseeable future, so you’re safe giving them a starring role in your makeover. Combining bronze and copper in the kitchen might give the room an “eclectic” look, but in a few years, chances are good it will just look confused. Same goes for stainless steel and gold, or nickel and brass. He should know: Dresner has designed more than 7,000 kitchens, and his airy Chicago renovation won K+BB’s 2014 Kitchen of the Year Design Award. Still want the look? Try mixing in different metals with replaceable hardware such as drawer pulls and towel rings, so you can easily ditch them if you put your home on the market. Making your own concrete countertops is all the rage on Pinterest, but kitchen designers think the trend is already passé. Because countertops are the kitchen’s primary focal point, it’s important to ensure their longevity. Picking a trendy material will—at best—annoy the hell out of you in a few years. In a decade, it might make your home impossible to sell. Better to spend a bit more on a surface you’ll love for a long time. There’s a time and a place for open shelving—a few simple marble-and-steel slabs can look stunning. But swapping all of your cabinetry for open shelving is a soon-to-be-outdated fad. “Open shelving is a thing that could be done very elegantly or very cheaply,” says Dresner. Simply pulling off the cabinet doors to mimic the effect is a surefire path to an unattractive, dust-collecting kitchen. If you’re interested in the look, a designer can help you combine minimalism, style, and functionality. Another recession response that’s fast approaching (or already surpassing) its sell-by date, reclaimed wood can look either superb or terrible, depending on its application. So if you’re itching to integrate repurposed wood into your kitchen style, focus on horizontal surfaces, where it has a tabletop effect. Unless you’re living in a loft, skip the stainless-steel countertops, exposed Edison bulbs, and aluminum shelving. “The industrial look is making its way out,” Rapone says. If you want the effect without the commitment, she recommends finding an industrial-looking lamp that can be easily swapped out when the trend passes its prime. But whatever you do, Dresner strongly recommends avoiding the exposed-lightbulb look. “There are so many cool lights at Restoration Hardware that have that industrial feel, versus something that looks like it should be in the basement of an old building hanging from a block,” he says.